Enterprise storage infrastructure is complex by nature, with storage requirements growing exponentially. Traditional storage methods comprised on-premises primary storage with the public cloud used for cost-effective backup and archive. However, in the face of massive data growth, traditional technologies run the risk of poor data protection and recovery practices. Additional challenges include continued operating expenses and IT overhead to protect growing data scores. Hybrid Cloud Storage integrates the high performance and control of on-premises storage with the dynamic scalability of the public cloud. 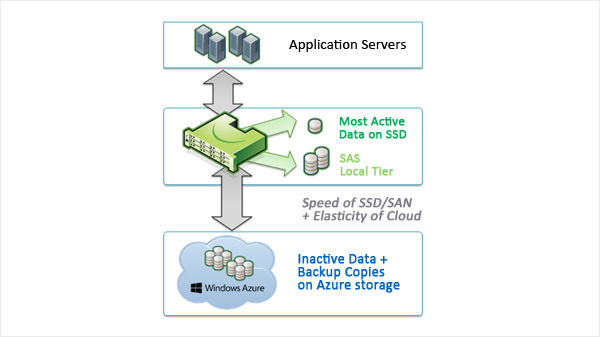 Microsoft's innovative technology enables a true, integrated solution for hybrid cloud storage. In this fully integrated architecture, IT retains on-premises storage strengths such as local performance for active data, fast recovery, and strongly encrypted data, coupled with cloud-based storage capacity on-demand. At the same time the cloud also provides a very secure and efficient storage tier for timely data protection and recovery. 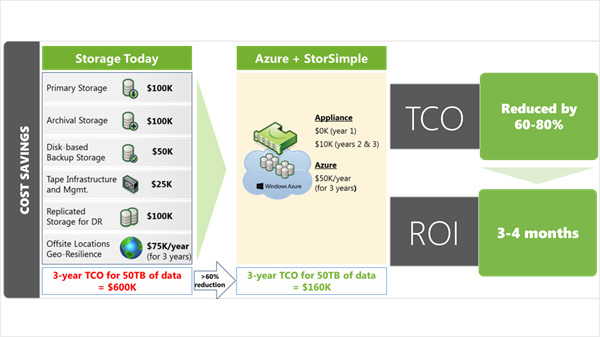 Microsoft's StorSimple cloud-integrated storage (CiS) provides primary storage, backup, archive, and disaster recovery. Combined with Windows Azure, this hybrid cloud storage solution optimizes total storage costs and data protection for enterprises.